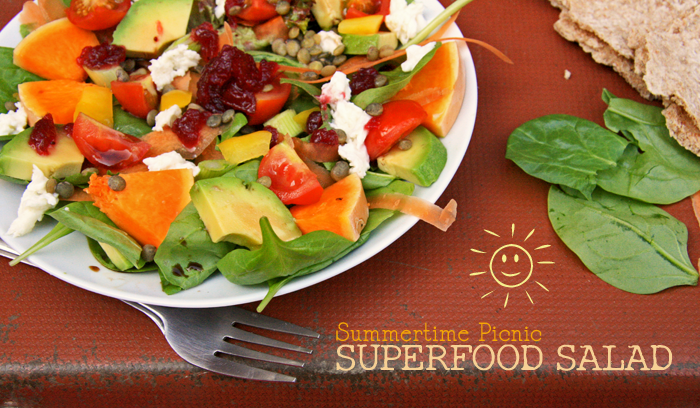 Summertime Picnic - Superfood Salad - Fork and Good. Beer gardens are full, people are having barbeques, I've seen more man chests than I care to count. It's officially summer and I'm loving it. It's like the whole country is on holiday. We run out of work each day like it's the last day of school, fling off our shoes, show more flesh than should be socially acceptable in public and embrace every single last ray. Well most of us do. Yesterday I saw a man in a rain coat. Some people have no faith. So I'm totally getting my salad on lately. Partly because there's no way in hell I'm putting the oven on when the kitchen already is one. 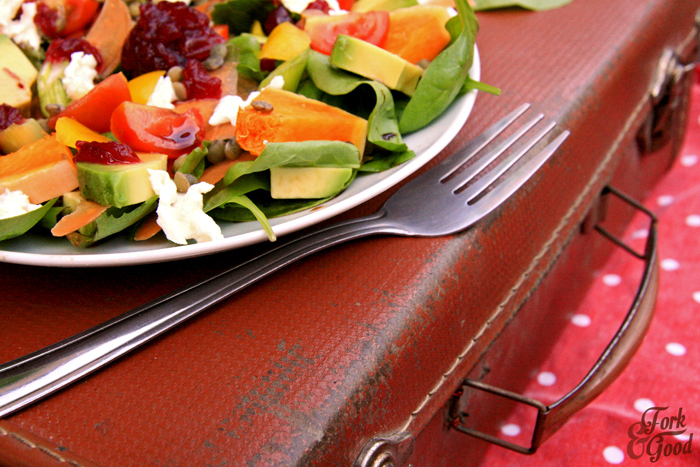 Plus, there's something lovely about eating a nice cold salad as the sun shines down on you. This one is easily packed up in a lunchbox and taken on a picnic too, which I did. Into my garden because the car has broken down. 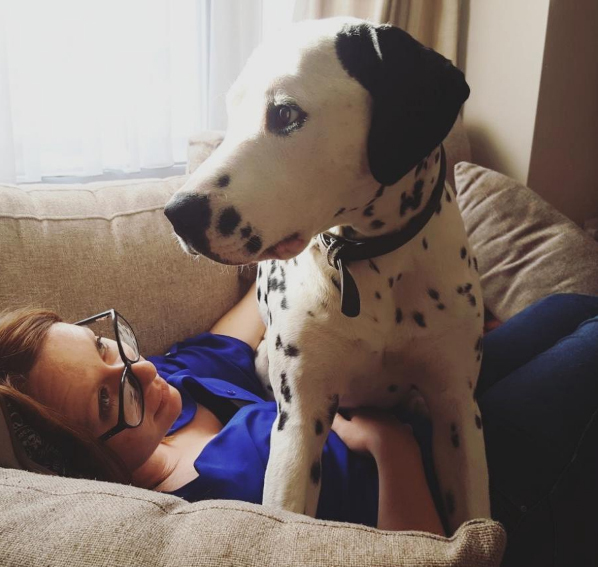 No slightly squished sandwiches and pork pies for us. This was served with a nice cold glass jug of pimms & lemonade too. What is a superfood? I'm going out on on a limb and saying that it's pretty much anything good for you. I'm probably wrong and I'll probably get an email telling me exactly what a superfood is. But I like to think that this bad boy is pretty super. Helps that it tastes damn fine. If you like salads that is. Wanna hear a nice bit of irony? Inspiration for this post came from a dish I had at a pizza restaurant. This serves two. Prep all your vegetables. This includes, removing the flesh from your avocado and chopping it up, chopping up your butternut squash, slicing your spring onions, peppers, tomato and carrots, and washing it all with your salad leaves. Now, drizzle it with lemon juice to keep it from going brown and manky. You'll need to do some cooking. I obviously cooked my lentils and I steamed my butternut squash using an odd shaped microwave contraption. But it's also really nice roasted. Go for what you'd prefer. If you're taking it on a picnic, I'd store it in the fridge and make it no more than a day in advance. Beetroot goes nice in this too if you're looking for more colour. If you're looking to make it meaty - chargrilled chicken is a winner. 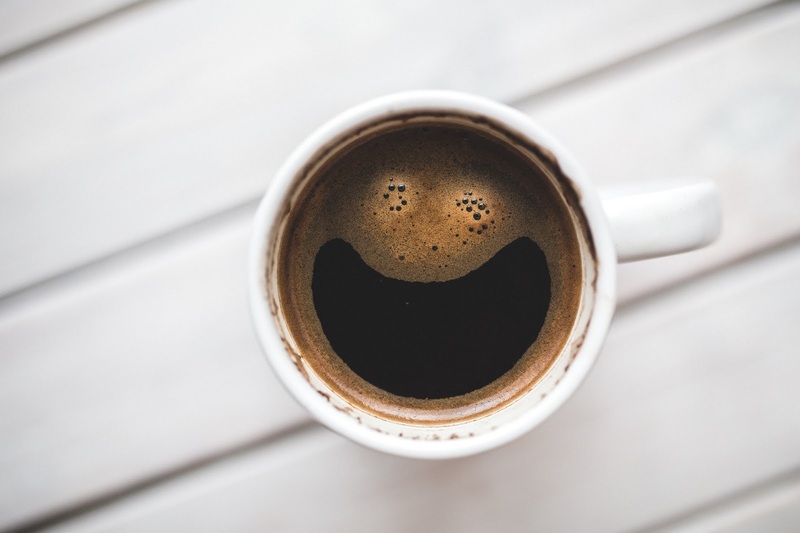 Enjoy the sunshine, wherever you are! It's pretty SUMMER over here too. I meant it's not very usual we have a HOT summer. I will definitely go for the salads instead of beer. Your salad looks beautiful and appetizing. 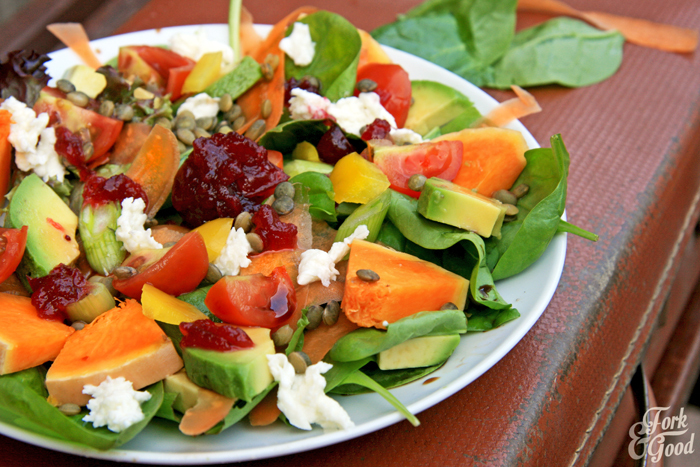 What a great looking summer salad! I'm intrigued about using cranberry sauce as a topping! I love the idea of topping everything with cranberry sauce! The salad looks beautiful and delicious. Dear Emma, This is super food!! It is super good, super tasty, super cool, super filling and I am sure super delicious!!! I have been eating a lot of salads this week too! You are correct; the kitchen is already an oven! Emma, this is salad is beautiful!!! It looks mighty tasty too. I love all the ingredients you used for this salad. 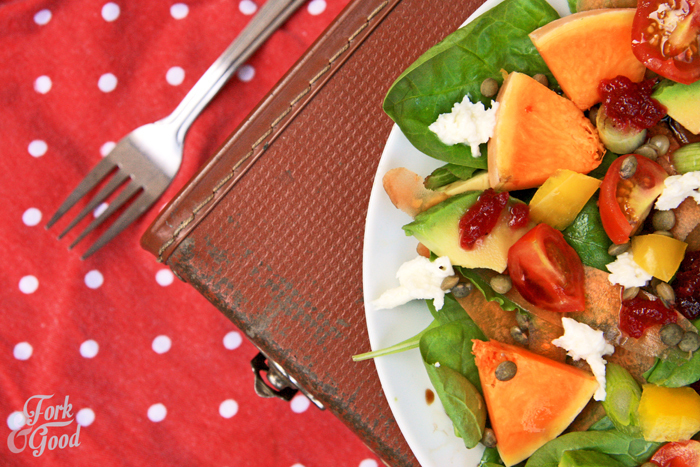 Loving your salad, feels so fresh, summer time and would make me feel energized! Lovely job! This looks like such a great summer dinner! I love avocados right now!